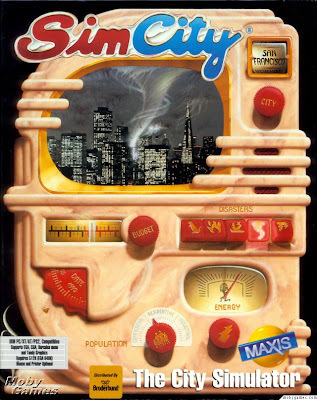 Going a little further back than this, there was a time when games came hand-packed in a ziploc bag, with mimeographed instructions stuffed inside. And as often as not, the developer's address was their *home* address. Good times. Is the distance between developer and player caused more by the size of dev teams, or by the size of the audience? 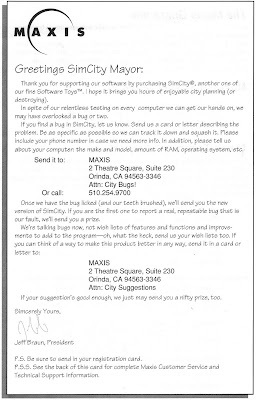 Also: I love the phrase "Software Toys," and think it's way overdue for a comeback. I think conduits like forums and Twitter can actually help foster the personal connection to a fan base. Look at Introversion, for example. Their devblog is posted to a forum where anyone can chime in, and they talk openly about financial woes, design challenges, etc. I think the wall comes up when your company gets so large that marketing handlers and PR people creep into the mix and start managing things for you, deciding what image is right for the company, etc. Sure, if your fan base is large enough, you can't reasonably chat with everyone, but the mass messaging can still be pretty genuine. I have the exact same box on a bookshelf here in the office. I just pulled it down and yes, it does contain that card! Very nice. I certainly do not think that developer becoming more divorced from the players is a bad thing. Ah.. but I do missed the good old days. I don't call our kind nostalgic. I call us "hopelessly romantic". There are something innately fulfilling about riding steam engines in this age of air planes, or the smell of a hand written letter over e-mails. A human touch, maybe.